Plugging Sale This week Only! The New Pro Series Danny Surface Swimmer is the Lure that Captain Al Lorenzetti uses when plugging for Big Striped Bass. When Gibbs designed their new Pro Series Danny Plug Captain Al Lorenzetti was there to give his suggestions. The new design and added features make the plug deadly on Stripers. 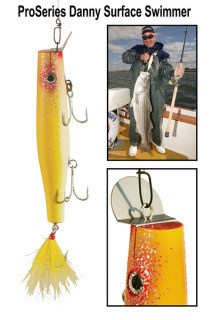 This Hot lure will sure to be a topperformer on Striped Bass and it's a must have in your tackle arsenal.